Dr.Kumar Dhawale, Chairman of the Institute, Dr.A. Ramdas, Convener of the Bengaluru Branch, Ms. Shubha Punja Sandalwood actresses, Dr.B.T.Rudresh, Member, Karnataka Knowledge Commission was in the occasion. The Scientific sessions which followed provided glimpses into the excellent results obtained by Homoeopathy in the field of Public Health. The delegates for the scientific sessions, who were about 700, had arrived from all over Karnataka. Teachers, doctors, students from all the colleges of Karnataka and neighbouring states took part in the day long deliberations. Next financial year may see more funds for AYUSH .Commenting on homoeopaths being an integral part of the medical force in the country, the minister said the funds will be dispersed in the 13th Five Year Plan. 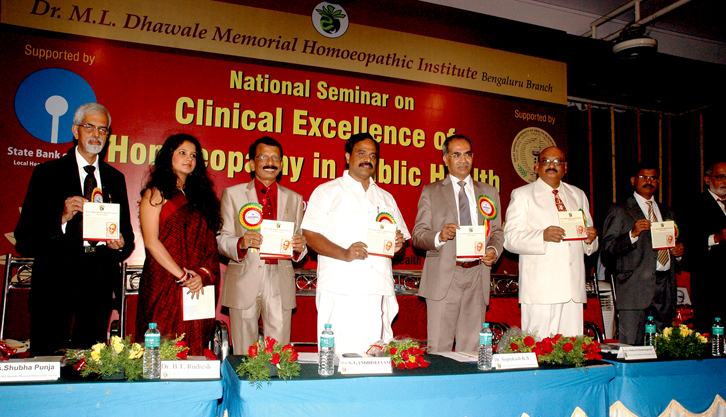 "Homoeopathy enjoys a huge popularity among the urban and rural community. It is a boon for a developing country like India as it provides a permanent relief at an affordable rate," said Gandhiselvan. Minister of state for Health and Family Welfare K S Sriprakash, vicechancellor of Rajiv Gandhi University of Health Sciences, said the need is to make all doctors nodal centres for the community.